Product prices and availability are accurate as of 2019-04-23 18:56:35 EDT and are subject to change. Any price and availability information displayed on http://www.amazon.com/ at the time of purchase will apply to the purchase of this product. Little minis are here! How cute are these darling wood signs?!? ***NOTE*** THESE ARE MINI!!!! You pick your state! All of our signs are designed & handcrafted by Three Arrows. Painted whitewashed wood and distressed for a rustic look. We add wall hooks on the back for easy hanging! SIZE: Approx. 6x7 inches (+/-). NOTE: All signs are hand-cut and size will vary slightly. PLEASE READ: Not all states will fill up the entire space. 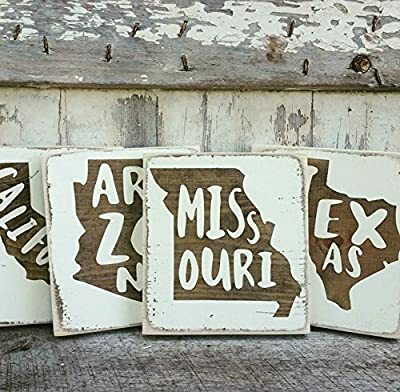 Each is unique, we try to fill the board as much as we can while keeping the correct ratio and dimension of each state. CONTINENTAL UNITED STATES ONLY.